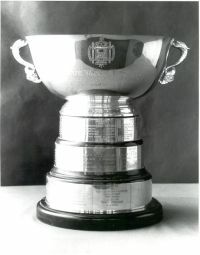 History: The Aloha Cup is one of four trophies belonging to Lloyd-Phoenix that came into the possession of the Naval Academy. Lloyd Phoenix graduated from the U.S. Naval Academy in 1861 and served in until the Civil War. He resigned his commission in 1865, went into business, and became a yachting enthusiast. He won the Aloha Cup in an annual cruise of the New York Yacht Club in 1910, sailing his most famous yacht, Intrepid. 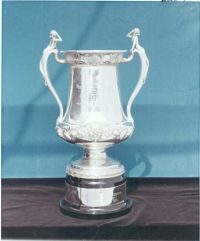 Awarded annually to the Yacht Club and skipper winning the Lloyd Phoenix Regatta. Originally, ten Naval Academy yawls manned by members of nine invited yacht clubs and NASS, sailed a series of races over a two period. 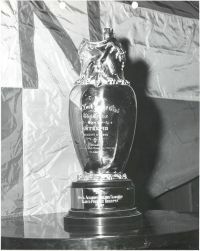 Recently, this trophy has been designated as the award for US SAILING's large yacht championship..
Lloyd Phoenix graduated from the U.S. Naval Academy in 1861 and served in until the Civil War. He resigned his commission in 1865, went into business, and became a yachting enthusiast. He won the Aloha Cup in an annual cruise of the New York Yacht Club in 1910, sailing his most famous yacht, Intrepid. 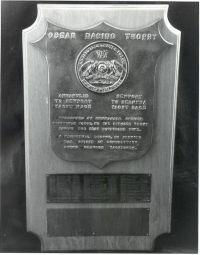 This trophy was given to the Naval Academy by the Commander of the US Atlantic Destroyer Forces. It is awarded annually by the Commander of the Cruiser Destroyer Force.